SAN DIEGO — The signposts of a Chicano renaissance are everywhere. On streets and college campuses, in fashion and in art, there's renewed energy around a term associated with 1960s civil rights and farm worker activism. “Being Chicana means you have a responsibility to your people,” said Olivia Parraz, 22, as she strolled along San Diego's Chicano Park in a tank top emblazoned with the word "Chicana." 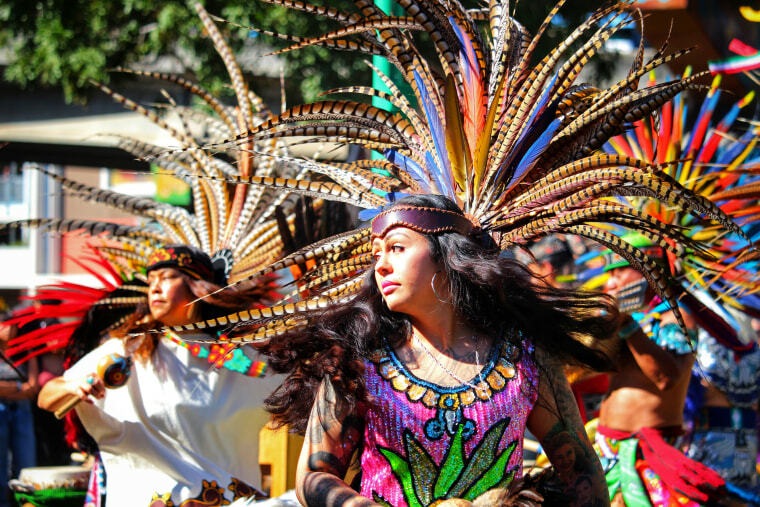 Chicano is a word popularized by an older Mexican American generation, but it has been experiencing a revival at a time when an expanding, young Latino population is asserting its place as the country wrestles over issues of race, rhetoric and identity. “Here in Southern California we’re having a cultural and political renaissance of the term,” said Alexandro José Gradilla, associate professor of Chicana/o Studies and African American Studies at California State University, Fullerton. The backdrop for the resurgence includes a Golden State where Latinos now are 39 percent of the population and represent California's largest racial or ethnic group. More than a third of them are age 20 or younger, according to the California Senate Office of Research. The park, with its large collection of murals andits own Chicano activism roots, is in Logan Heights, San Diego's oldest Mexican-American neighborhood. “The gloves are off with the alt-right,” said University of San Diego ethnic studies professor Alberto López Pulido, a longtime member of the Chicano Park Steering Committee. He has volunteered as a community organizer in nearby Logan Heights for more than a decade. “Trump's actions, words, and tweets, have made Chicano-style activism more necessary,” he said. The term Chicano first came into wide usage among Mexican-Americans in the late 1960s as young activists stood atop the shoulders of United Farm Workers organizers Dolores Huerta and Cesar Chavez, and other Mexican American leaders who fought for an expansion of civil rights, focusing on wages, education and fair housing. It was a time of vigorous activism in the Southwest. In 1967, Reies López Tijerina led an armed takeover of New Mexico's Rio Arriba County Courthouse in a bid to reclaim the 600,000-acre Tierra Amarilla Land Grant, land that Mexican and Spanish families were supposed to be able to keep after the 1846-48 Mexican-American War, the first U.S. conflict on foreign soil. The next year, students on Los Angeles's Eastside participated in "blowouts" by walking out of class to demand an end to unequal education. In 1970, the National Chicano Moratorium, an anti-Vietnam War demonstration that drew hundreds of thousands and drew attention to Mexican-Americans' disproportionate service and deaths in the Vietnam War. “We are the in-between people,” said Phillip Rodriguez, the award-winning documentary filmmaker. This third way became the path that best describes Chicano, a Mexican-American rooted in a tale of an American Southwest that once belonged to the Aztec people, but where historically Mexican-Americans have been relegated to second-class status and not seen as "American" as Anglos. But while the term came to define how some Mexican-Americans felt — neither the U.S. nor Mexico fully accepted them — it alienated others in the community. The term and the movement seemed to hit a low point in the 1980s and '90s when assimilation and economic mobility became a goal for many middle-class Mexican-Americans. Many people with Mexican roots adopted the terms Hispanic and Latino, joining forces with Central Americans, Puerto Ricans, Cuban-Americans, Dominicans and South Americans. Waves of Spanish-speaking immigrants in the 1980s, ‘90s and 2000s upended the assimilation strategy. Waves of newcomers expanded and diversified the population — although the Latino population remains 63 percent. For some, even Latino did not capture their identity and their children didn't find it a good fit either. Even without the future president calling Mexicans criminals and rapists, Chicanismo has been on its way back. New Chicanos are nonetheless less militant and less nationalistic than their '60s forebears. Nowadays, Chicanismo is mostly about ethnic pride, cultural expression and the defense of immigrants. Professor June Pedraza, chair of the National Association for Chicano and Chicana Studies, says Mexican-Americans in their teens are showing up at her classes at Northwest Vista College in San Antonio eager to study the roots of the Chicano movement. “There is more of a demand for it now,” she said. Today's Chicanos are trying to protect immigrants and Dreamers, the term used to describe immigrants who were brought to the U.S. illegally as children. They're just as likely to fight for access to higher education as for better K-12 schools, and they're battling against gentrification in traditionally Mexican-American communities such as Los Angeles's Boyle Heights. And they're much more likely to defend the rights of women and LGBTQ Latinos, almost unheard in the 1960s use of Chicano, not unlike much of the general population. At the eight-acre Chicano Park in San Diego, amid food stands, T-shirt stalls and gleaming low riders, Sarina Sanchez, 29, was volunteering at an information tent for Border Angels, a nonprofit that organizes pro-immigrant demonstrations and leaves bottles of water in the desert for undocumented travelers. Sanchez majored in Chicano studies at UCLA and said she identifies with the gender- and sexual-orientation neutral term Chicanx. “The ‘x’ is a reclamation of my indigenous heritage and my feminism,” she said. Peter Ortiz, 28, is a tech industry worker in Silicon Valley who in 2016 founded the San José Brown Berets, which pays homage to the militant group of the 1960s. "There was a lot of toxic masculinity" in the movement's past," he said. "We’re not down with that." Social media and easily accessed history mean that young Mexican-Americans can quickly grasp the issues and contextualize them without having to be heavily involved in a movement. Latinos make up more than half of public school students in California, according to the state Department of Education. Noriega pointed out that the current defense-of-immigrants rallying cry was born under President Barack Obama, whose administration deported more than 2.5 million people. Chicanismo is having its day in the sun perhaps most luminously through youth culture, art and fashion. Los Angeles indie band Chicano Batman is exposing masses to the movement through a current national tour. It reached the heights of the Coachella Valley Music & Arts Festival in 2015. “Chicano Batman has put the word out there is something that’s not only political but something that’s hip and edgy,” Cal State Fullerton's Gradilla said. At Chicano Park, the clothing brand Pipiripau showed off its T-shirt and tank-top designs, which mix the gothic moods of Dia de los Muertos with the infantile playfulness of the manga comics of Japan. The clothing epitomizes the modern Chicano — global but immediately recognizable as Mexican-American. It's "part of the story of the Chicano experience,” said Rolando Rubalcava, 36, who co-founded the brand in Ventura, California. At the park, Marc Gonzales, 22, said you can't just wear Chicanismo on your sleeve. It comes with a call to intellectual arms.